Damn, people, it's a roundabout not a scanning tunneling microscope: it's not that hard to use CORRECTLY. I will attempt to outline how to properly use a roundabout, and if you are able to read t his then there is no reason why you aren't mentally capable of performing these actions. What scares me is the number of people out there who can't figure out the simple rules for indicating at a roundabout. 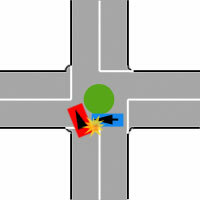 Indicating left when entering roundabout. This is a crude diagram of a roundabout, the blue and red rectangles represent cars, with arrows indicating their direction. The blue car is indicating left. 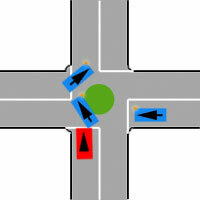 The red car therefore assumes the blue car is turning left, and decides to start driving. WRONG. Indicating left in and right out. This makes NO SENSE yet I have seen people do it. WHY? WHAT ON EARTH POSSESES YOU TO DO THIS? If you are someone who does this, do me a favour: get in your car. Put it in "D" (I know if you do this you can't possibly do something as difficult as use a clutch). Drive forward until you hit a nice solid object (please, not a child or animal). Put your car into "R". Reverse your car back ten metres. Put car back into "D". Drive into solid object again. Repeat until your car is undriveable. This is not stupidity, it's just lazy. Actually wait, if you're too lazy to flick a lever, you are stupid. Wow, that's not hard is it? 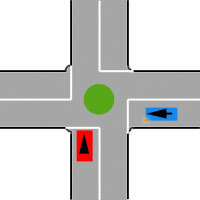 In fact, if you're smart, you'll notice that the direction to indicate when leaving the roundabout is ALWAYS THE SAME. Wow. Even less to learn. When going straight: don't indicate before entering, indicate left after passing the first exit on your left. SIMPLE. 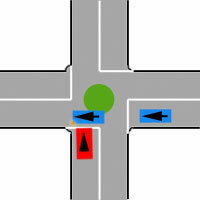 When turning right: indicate right when entering and when driving past the first exit on your left. 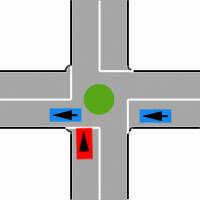 Begin indicating left immediately after passing the second exit. Continue indicating while leaving the roundabout. You may stop indicating after you are clear of the roundabout. SIMPLE. And if you can't figure out the whole indicating left thing... well... words fail me. Give way to traffic crossing your path from the right. That is all. Don't be "nice" and let the person on your left go. No. BAD. This ruins the whole rule, confuses people, and you're actually not being nice. I'm right. If you disagree, you're wrong. Go read the Road Code. Still think I'm wrong? Email me: ben <at> newted <dot> com.